The most important feature of the new Realme U1 smartphone is the existing flagship chipset MediaTek Helio P70 processor. It is the world's first handset that has been launched with this processor. 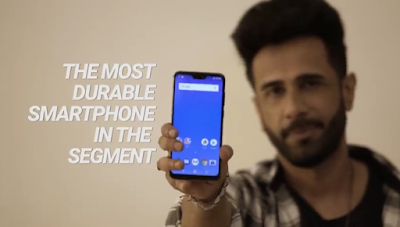 Realme U1 also features 'DuDrop', display, 25-megapixel front camera, and dual rear camera. Realme U1's 3GB RAM / 32GB storage variant is priced at Rs 11,999. The handset's 4 GB RAM / 64 GB storage variant costs Rs 14,499. Realme U1 has a 6.3-inch FullHD + IPS LCD display which has a resolution of 19.5: 9. The screen's density is 409 ppi and for protection, Corning Gorilla Glass 3 has been given. On top of the display is DuDorp Notch, which has a front camera. The phone has the MediaTek Helio P70 processor. The handset has RAM 3 GB and 4 GB. There is an option of 32 GB and 64 GB variant for inbuilt storage. The device has two rear sensors with 13 megapixels (aperture F / 2.2) and 2 megapixels (aperture F / 2.4) with LED flash. A 25-megapixel front camera with aperture F / 2.0 for selfie aperture has been given. Realme U1 dual SIM offers and two SIM cards and one MicroSD card slot. The phones have been given features such as 4G VoLTE, Wi-Fi 802.11 B / G / N / AC, Bluetooth 4.2, GPS, A-GPS, USB Type C / Micro-USB port. The handset also has features like M-sensor, G-sensor, Gravity sensor, fingerprint sensor, light and proximity sensor.